While the induction of full reprogramming in vivo via the expression of the “Yamanaka” reprogramming factors (OCT4, SOX2, KLF4, and MYC or OSKM) in adult mice leads to teratoma formation and death [1, 2], partial reprogramming in vivo by short‐term cyclic OSKM expression improves signs of senescence in progeria mice , enhances muscle and pancreas regeneration in old mice , and promotes traumatic brain injury repair . Researchers from the laboratories of Hans R. Schöler and Guangming Wu (Max Planck Institute for Molecular Biomedicine, Münster, Germany) hoped to take advantage of partial reprogramming in vivo to enhance wound repair in a mouse model, and their fascinating new STEM CELLS study now indicates that this process can reduce fibrosis and scar formation and promote enhanced wound healing . Doeser et al. employed OSKM‐inducible transgenic mice to specifically activate transcription factor expression in cutaneous wounds for short periods of time. Fascinatingly, partial reprogramming in vivo led to a reduction in fibroblast migration, lower levels of fibroblast‐to‐myofibroblast transdifferentiation, and inhibited wound contraction without impairing the process of reepithelialization. Subsequent gene expression analysis highlighted a correlative downregulation of profibrotic marker genes via suppression of the transforming growth factor beta (TGF‐β) signaling pathway. Overall, partial reprogramming in vivo improved tissue healing and reduced scar tissue formation, thereby highlighting this approach as a relevant regenerative therapy for tissue injury and fibrotic diseases. The authors now hope to clarify which factor or factor combination contributes to the anti-fibrotic effect, to study the longer-term effects of partial reprogramming in vivo on fibrosis, and to study this new approach in terminally developed fibrotic conditions in the hope of treating human patients suffering from conditions including hypertrophic scarring, liver cirrhosis, and pulmonary/renal fibrosis. For more on this exciting approach to improve wound repair, stay tuned to the Stem Cells Portal! Ohnishi K, Semi K, Yamamoto T, et al., Premature termination of reprogramming in vivo leads to cancer development through altered epigenetic regulation. Cell 2014;156:663-77. Abad M, Mosteiro L, Pantoja C, et al., Reprogramming in vivo produces teratomas and iPS cells with totipotency features. Nature 2013;502:340-5. Ocampo A, Reddy P, Martinez-Redondo P, et al., In Vivo Amelioration of Age-Associated Hallmarks by Partial Reprogramming. Cell 2016;167:1719-1733.e12. Gao X, Wang X, Xiong W, et al., In vivo reprogramming reactive glia into iPSCs to produce new neurons in the cortex following traumatic brain injury. Sci Rep 2016;6:22490. 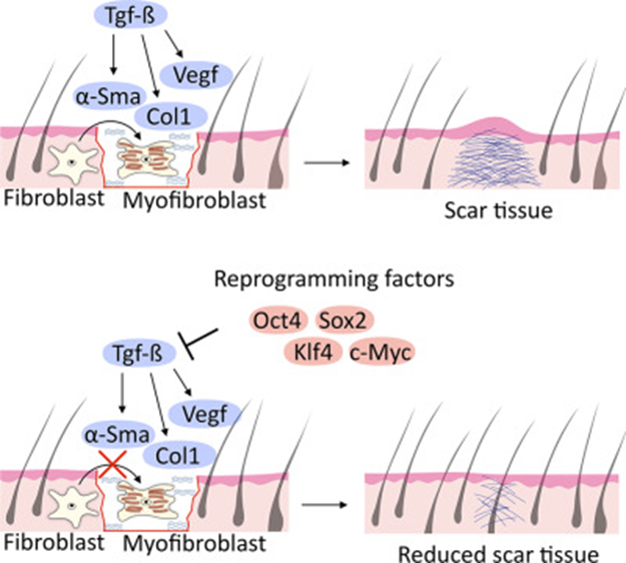 Doeser MC, Schöler HR, and Wu G, Reduction of Fibrosis and Scar Formation by Partial Reprogramming In Vivo. STEM CELLS 2018;36:1216-1225.